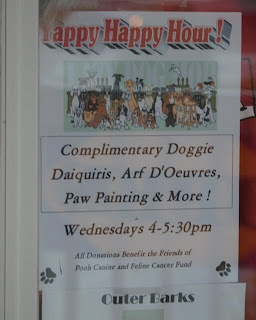 An absolute must on every Wine Doggie's schedule when visiting the Outer Banks is Yappy Hour, held at the Outer Barks at the Shoppes at Scarborough Lane. 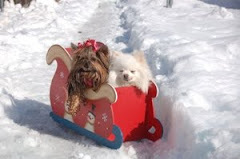 Hosts Kevin and Robin Carey ensure that everyone has a doggone good time. On most Wednesdays, the field behind the store is filled with all kinds of games and entertainment to keep for vacationing furkids and their families. 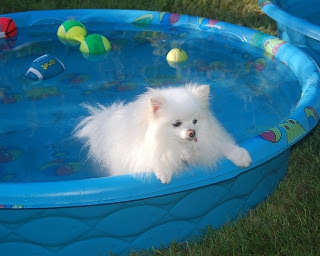 and Roy can impress the ladies with his prowess in the pool.. 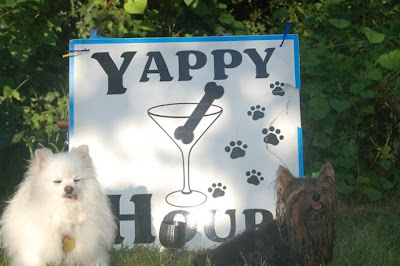 Even this year's rainy afternoon couldn't dampen the Yappy Hour spirits. A little drizzle is no reason to let those specially prepared Arf d'Ouvres that Munchkin loves to munch or the potent Dogquiri cocktails Roy enjoys sipping go to waste. To help everyone stay dry, the venue was moved to the deck in front of the store. Munchkin wasted no time diving into the turkey fritata and apple spice cake that Robin had prepared. And Pomeroy savored the cool Puppachino. The Wine Dogs met up with dogs by the dozens, including dachshounds and labs, a Maltese duo and aptly named Beefy the Bull Dog. 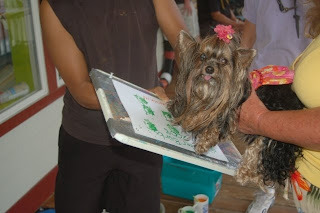 Munchkin and Pomeroy also got a chance to show off their artistic skills with a little paw painting. The Wine Dogs finished the evening with a shop-til-you-drop run through the store, which stocks their favorites from Bark Vineyards... Barkundy, Sauvignon Bark, and Pinot Leasheo. 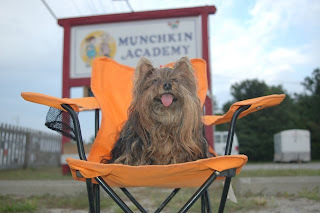 Munchkin picked up a copy of Yorkie Diaries for beach reading. The only think missing was Robin, who was taking one of the Outer Barks Keeshondens for cancer treatment. 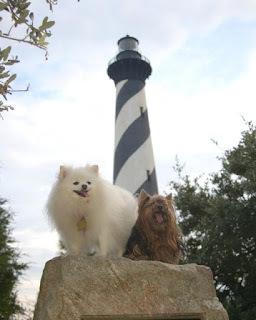 The Wine Dogs send puppy prayers, and remind everyone that donations at Yappy Hour help the Friends of Pooh, a 501(c)(3) non-profit or-ganization to help Dare and Currituck County dogs and cats with cancer receive the necessary treatment. 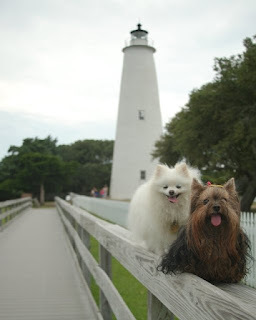 On Tuesday, Munchkin and Pomeroy decided it was time to explore the southern shores of the Outer Banks. 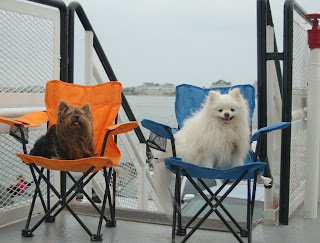 Aboard the North Carolina Ferry in Hatteras, the Wine Dogs created quite a stir when passengers recognized the celebs on board in their Cheers Chairs. Munchkin also checked in on her latest business venture, the Munchkin Academy of Wine. 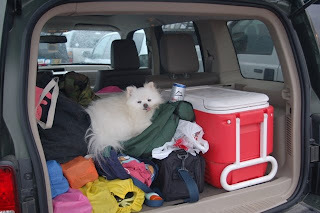 Pomeroy, however, played hookie and was discovered tail-gating and wagging. 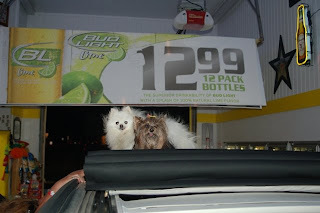 Apparently, the salty sea air left both Wine Dogs hankering for a cold one. 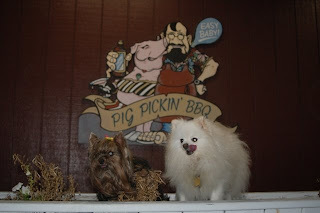 So on the way home they pulled into the Brew Thru to pick up a case of light beer (Munchkin knows a girl's got to watch her figure; but Pomeroy insisted they stop at Pig Man for BBQ to take back home to woof down. 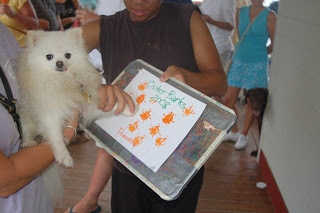 Wednesday is the famous Outer Barks Yappy Hour. The Wine Dogs can't wait! It's been great weather here in Duck. Long walks on the beach in the morning. Lazing in our new beach chairs all afternoon. Cocktails watching the sunset over the inlet in the evenings. 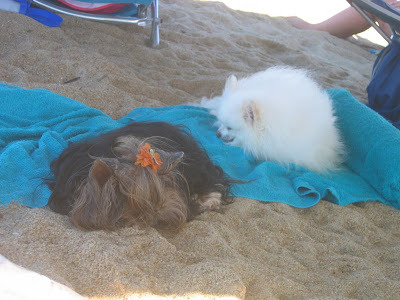 It's a dog's life, and we love it! 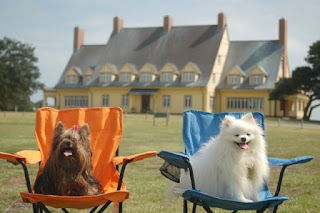 Munchkin and Roy took time out from the beach to check out the weekly Wednesday afternoon Wine Festival at the Whalehead Club on the Currituck Sound. Julia Jordan, whose job was to educate us about "the club" while pouring delicious French wines, told us the Whalehead is actually a beautifully restored home originally built in the 1920s. It's got 21,000 square feet... that's some dog house with room for lots of puppies! As two- and four-legged oenophiles sampled the various wine offerings, local performer Kim Kalman entertained with her sultry, voice, accompanied by sounds guitar. The Wine Dogs first discovered Kim's singing a couple of years ago in Duck, and it's always a treat to hear her play. While Pomeroy explored the marshes, Munchkin found her niche wine among a wide array of offerings from the Corolla Wine, Cigar, and Gourmet shop. 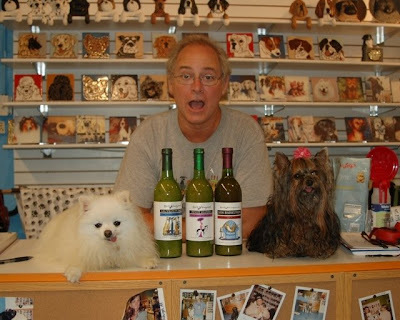 The Wine Dogs were especially impressed with the pawsitive hospitality provided by Tom, whose family owns GiGi's Coastal Italian Restuarant. He has promised a dog-friendly deck and Mom's homemade sauces and Tiramisu. Dinner on Saturday... Munchkin is already salivating. 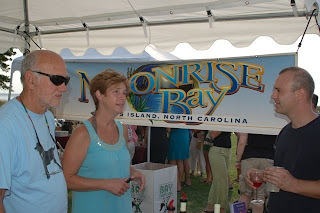 Munchkin and Pomeroy also got to check out Moonrise Bay, one of the local North Carolina wineries. 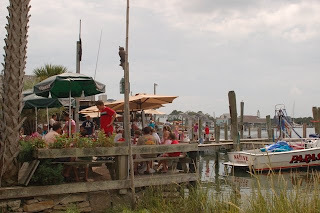 It's located on Knotts Island, along with Martin Orchard & Vineyards. 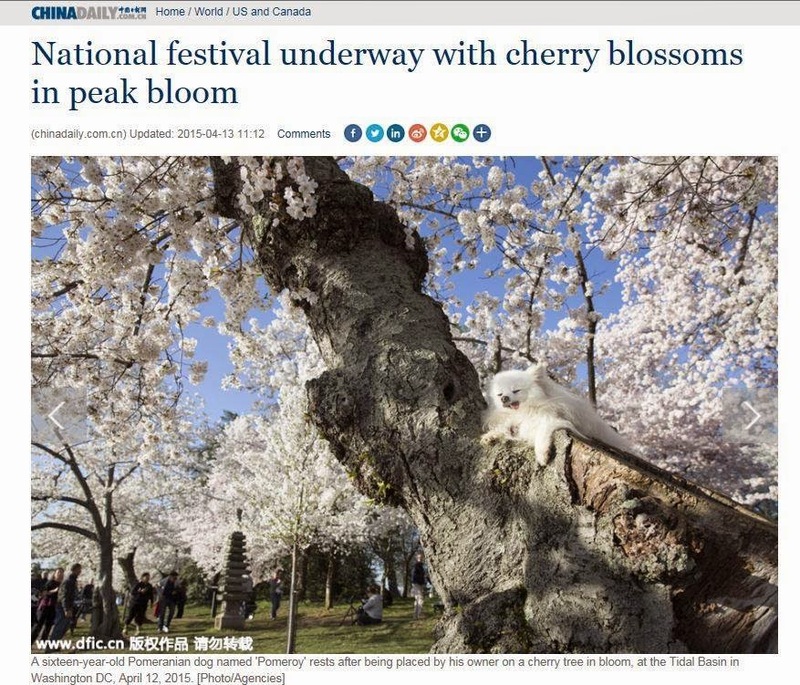 You have to take a furry boat to get there. Go figure. They had several wines, including a Muscadine, made from native grapes, and a raspberry wine which must have been quite popular because it was all gone before we got there. 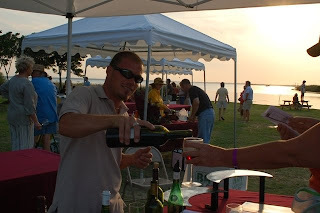 Speaking of moonrise, the Wine Festival finishes just as the sun begins to set over the sound. 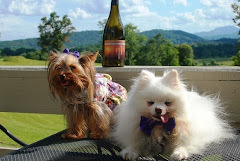 Wine Dogs recommend filling your glass and staking out a picnic table to relax and enjoy. 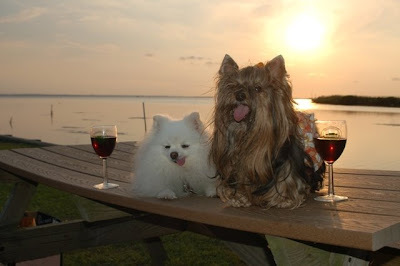 Wine Dogs are enjoying some well deserved R&R at the Outer Banks. We'll fill you in on the local wine scene. On day one, Munchkin and Pomeroy discovered they like Pina Coladas. It's a ruff life! Hear ye, hear ye: The winery formerly known as Stillhouse shall henceforth be known as The Philip Carter Winery. Huzzah! 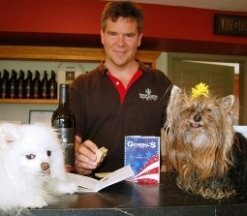 After running into PC-PR Maven Donna at the Linden Shell Station, Pomeroy and Munchkin decided it was time to check back in at the winery formerly known as Stillhouse and see how our friend Fairfax the Shih Tzu was doing in her new role as wine dog. Fairfax is very proud to have been named for Lord Fairfax, who granted 300,000 acres of land to King Carter, father of Charles Carter, maker of the first internationally recognized wine in Virginia and ancestor of Philip Carter Strother, the current owner. Talk about a name with history (both Fairfax and The Philip Carter Winery)! So it was little surprise that Charles Carter and Thomas Jefferson were on hand for official renaming on May 24th. 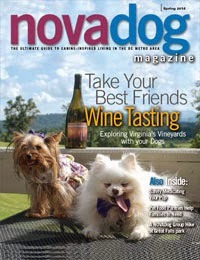 It attracted quite a crowd, including of course the Virginia Wine Dogs. This latest visit was all about the wine. Philip and Danielle greated us warmly, and Philip patiently introduced us to the new PC offerings of two whites, four reds, and two dessert wines. Falconwood is the PC white table wine, a fruity blend of Vidal, Seval, and Chardonney. The label features a beautiful Fauquier County landscape (one of several paintings by artist Adrei Kushnie that can be found around the tasting room). One dollar from each bottle goes to the Leeds Ruritan Memorial Scholarship fund for a student who pursues an education in vitaculture. 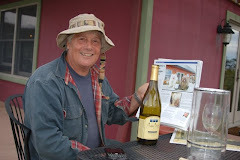 The other white, a light citrussy Chardonney, was just perfect for the Dog Days of August, and our choice for enjoying out on the patio surrounded by the lush vines with the Blue Ridge in the background. But first... the reds. 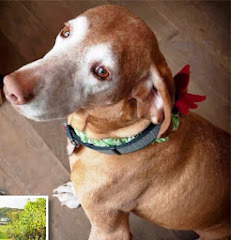 The line-up included a Chambourcin; a dry, peppery Cabernet Franc that Munchkin sniffed and confirmed "smells like Virginia"; as well as an earthy Cabernet with cherry undertonse and nice legs. The Meritage with its nice tannins set Munchkin's tail waggin', while Pomeroy enjoyed the locally produced Darby cheese. There is also an oh so PC late harvest Vidal with the usual sweetness but a less syrupy consistency than is common. Sweet Danielle is the name given to PC's port-style offering, and the label features a wedding cameo of Danielle. Philip worked secretly with an artist for months on the design, then invited his wife to dinner and "selected" the wine which was presented at the table to an emotional Danielle (Pomeroy, are you paying attention?). Is it coincidence that the new owners have added an event wing, perfect for weddings, including a bride's room? 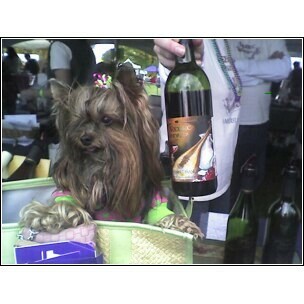 The Wine Dogs spent an enjoyable afternoon at PC. It was great to catch up with Fairfax, and to meet her boys, the five-year-old twins Carter (left) and Pierce (right), who kept us entertained with peaches and cheese to compliment our wine. Thanks, boys! 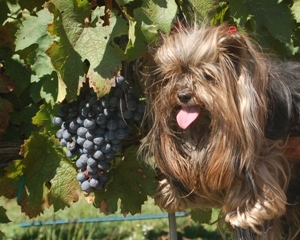 As the summer heats up, so does the Wine Dogs' social calendar. 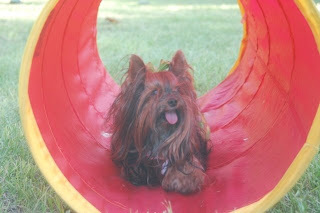 Munchkin and Pomeroy recomend a couple of fun doggie events this weekend. 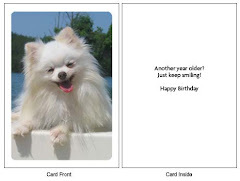 Come to Pomeroy’s official “Paw Signing” of his very own Hallmark Birthday Card. Thanks to everyone who came, and don't forget to vote for "Happy Boy" Roy. 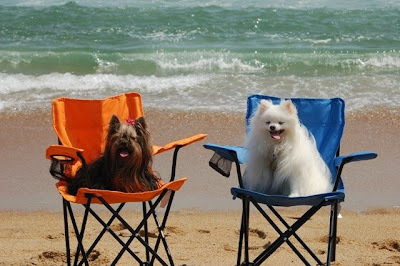 Our friends Brian and Sharon Roeder at BOW are hosting a Dawg Days of Summer weekend, and those who come with their best friends get 10% off all take out bottles of wine and 15% on all cases! Friday nite, August 1, from 6-9pm is TGISunsets. You can play in the grass or lie quietly cooling on your belly watching the sun fall lazily behind the beautiful Piedmont. Wonderful wine and lite fare on the patio and a great way to wine down the week! 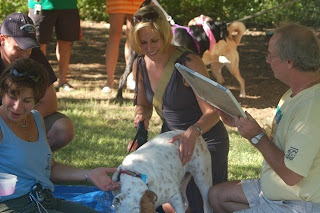 Saturday, August 2 is a Dawg Day with Paws n Claws pet photographers taking dog shots from 1 till 5pm. They''ll have hot dogs BBQing on the patio for a donation to our friends at Middleburg Humane. And there'll be a Doggies in Drag competition with prizes and snacks for all! Sunday, August 3 is a Dawg Day! 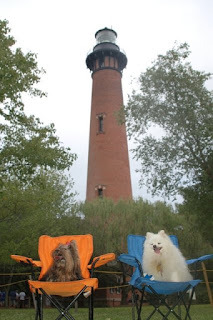 The fur flies with more photography by Paws n Claws, BBQ'd hot dawgs on the patio and prizes for the uggliest best friend and handsomest mutt. Of course, snacks for all of fuzzy friends! Downtown Frederick goes to the dogs with "Dog Days of Summer," on Saturday, August 2. The festivities begin at 5PM, featuring a dog contest, dog friendly stores, animal art & more and conclude with a Yappy Hour doggie after party that runs til 9 PM. Also enjoy live entertainment, guest artists and extended shopping hours at 80+ downtown stores. A portion of Dog Days proceeds benefit the event's co-organizer, the Frederick County Humane Society.